Potatoes are essential (8 pieces), two pinches of Salt, 1 tablespoon of oil, Salted Butter, Milk (whichever preferred), a slice of cheese (optional), pepper and a folk to mash the cooked potatoes. Personally, I prefer using imported potatoes and Australian Potatoes were the only imported one which I could find when I visited the grocery during the day before. Such a large potatoes I have bought. I cut it into 4 slices each potatoes to speed up the time of potatoes to became cooked. Water level that covered the sliced potatoes were perfect to monitor its progress while cooking! Reminder! Don't forget to add in 2 pinches of SALT and the 1 tablespoon of OIL into the boiling water. Interestingly, the potatoes or the spaghetti being boiled/ cooked that way will make them taste better. 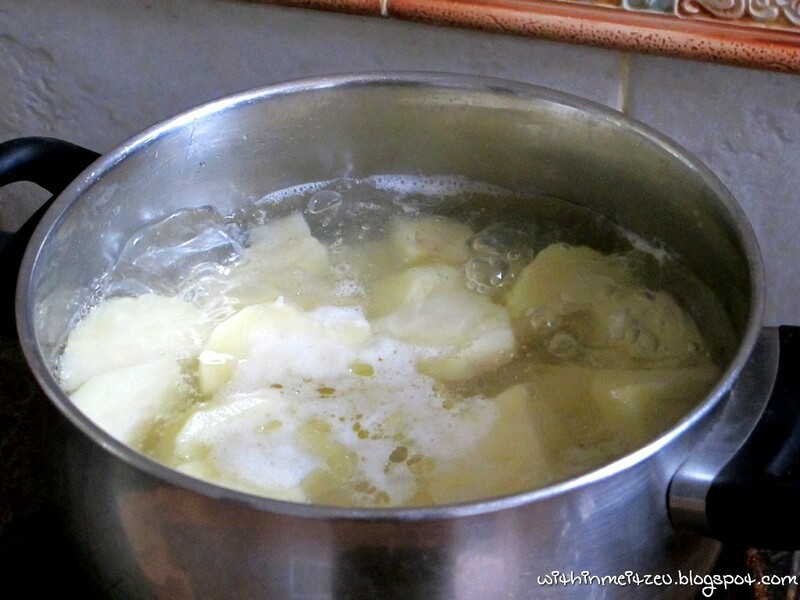 When the boiling water became yellowish, I used a knife to cut the potatoes to make sure it was fully cooked. Once it was cooked, switch off the gas stove and pour away the used water. Mash the potatoes by using FOLK, added in 1/6 of the SALTED BUTTER and a few pinch of SALT (or added in later/ in the end if the mashed potatoes doesn't suit your taste buds) while the potatoes were still warm/ hot. Switch on the GAS STOVE and turn it in to slow cooking/ low fire mode, add in MILK (I used half pack of it and added in a little portion for few times) while the pot of mashed potatoes being cooked once again, DO make sure the mashed potatoes won't burned while making it hot again, MILK is important to make the mashed potatoes texture taste better. :) The more you add, the smoother it will be, HOWEVER, too much milk will be overdone. 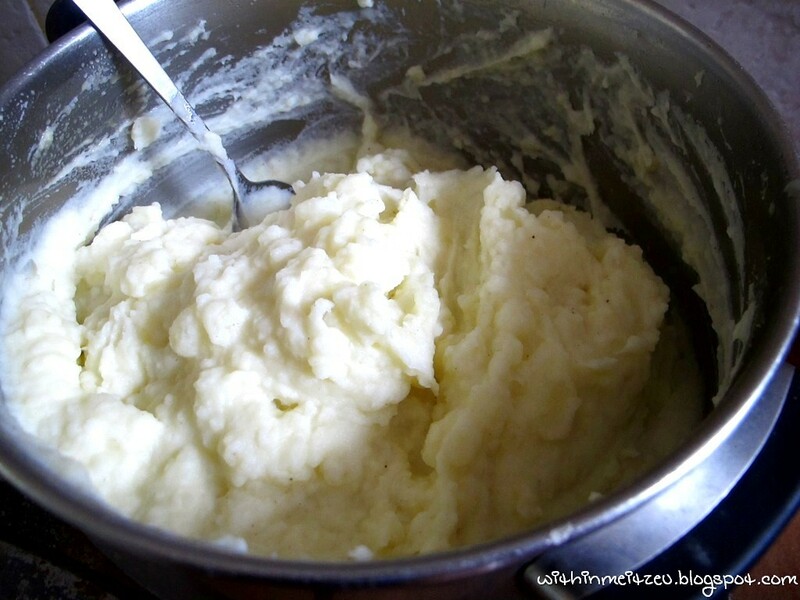 Freshly cooked mashed potatoes. :) Turn off the gas and sprinkle the pepper (I used Black Pepper here) in to it to give it a less "bored" taste while consume it later, even stirring it before serving the guests will taste good! Optional : A slice of cheese can be added too to spice up the mashed potatoes, even if we doesn't add in, it won't be a problem which the mashed potatoes still taste perfectly good. 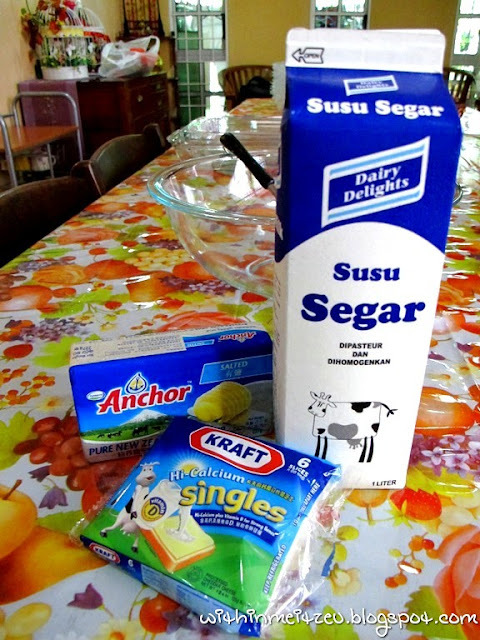 For a healthier cooking method, eliminate the cheese and reduce the amount of butter. In facts, the potatoes were huge and I have prepared 2 large of mashed potatoes which in the end, all of us can't managed to finish them at one time while we have various tempting food to eat! No matter what, they agreed that the mashed potatoes taste scrumptious and we finished them after a few days. "WHO SAY I CAN'T COOK??" LOL! My colleagues doesn't believe that I can cook though, which I'm lazy to explain that much too. :P Now you know I can cook besides preparing the instant noodles with egg. Wow! Your potatoes look so delicious! Thanks for teaching us how to cook it! A lot of fast food restaurant is using powder form of mashed potatoes..
BTW the meat looks juicy n nice. Is it beef? You can cook but is it nice.. LOL.. POTATOES!!! 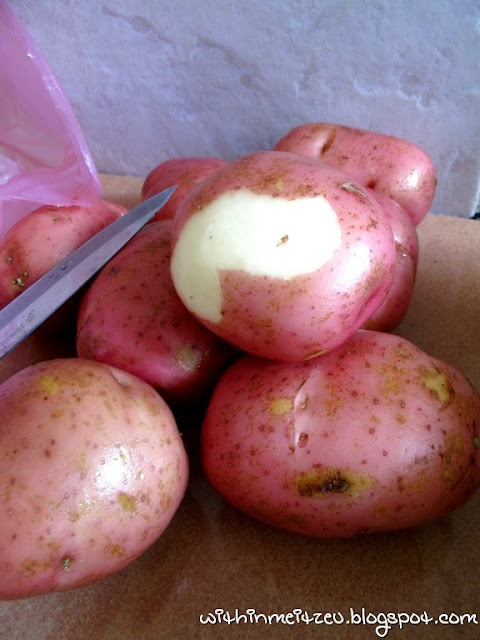 =D I love potatoes, even wrote a love letter to them once, early days of my blog! Hahaha.. Yours look delicious!! Happy Chinese New Year girl!! Miki : You should try to make it, it's simple! 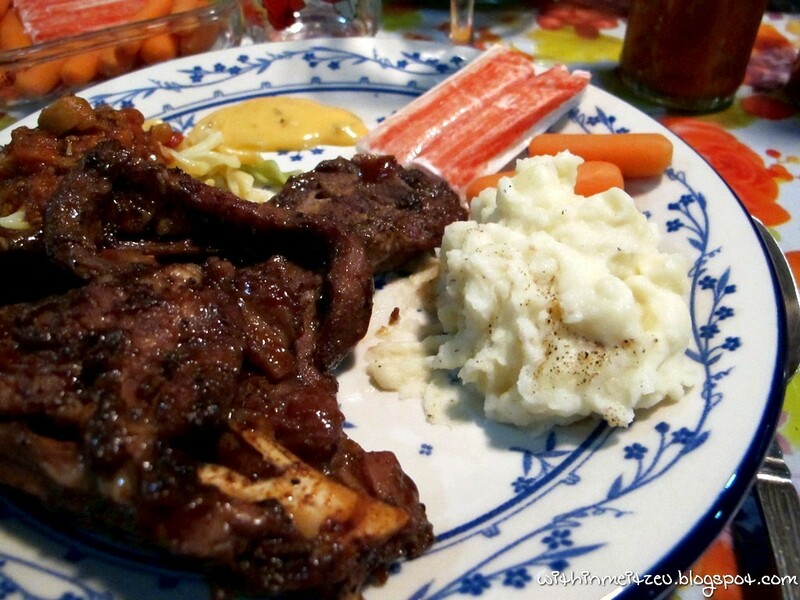 Simple Person : That is lamb chop which prepared by my dad/ mom. Ofcoz I know how to cook, both of my parents are awesome cook! Daniel : Yea~ Very sinful with all those carbohydrate. Mashed potatoes are definitely a UK comfort food. If you ever make oven chips - you know, big fat chips with skins - my son used to love those with melted cheese on top. An easy variant for a cook like you! 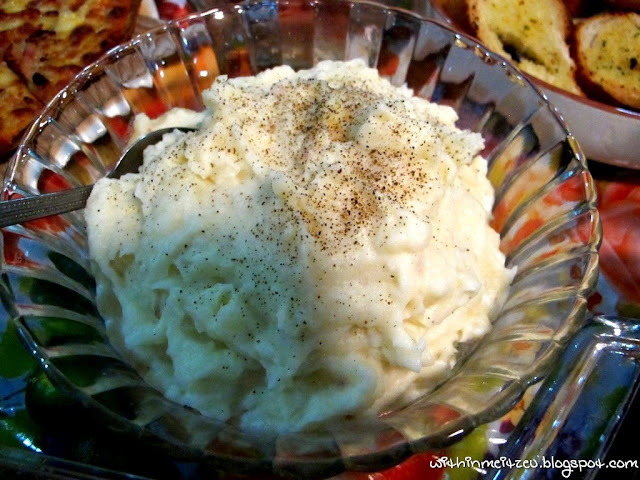 You sure can cook after seeing this mashed potatoes. We simply adore potatoes and it does not matter how its cooked and like anything goes with potatoes.